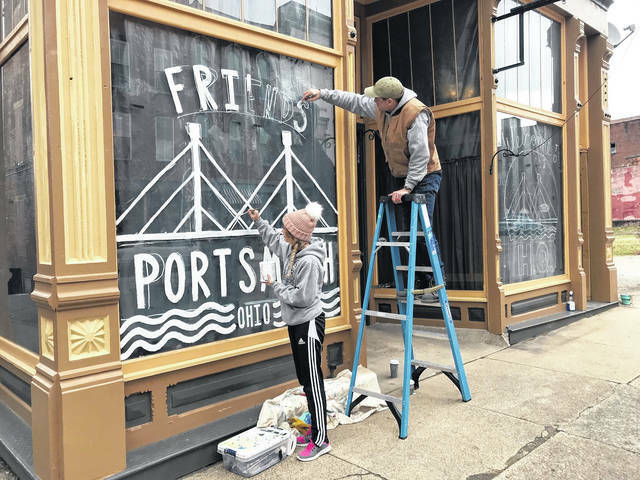 Even though the headquarters wasn’t open, in early December, NSD, a local design firm, put some holiday decorations in the windows of the now newly opened headquarters of the Friends of Portsmouth on Second Street. The appointed spokesperson for the group, Nick Rutman, of Rutman Burnside Realty, said he could not release many details on the somewhat mysterious, yet fairly well-publicized, trip south of several members of the grassroots community organization Friends of Portsmouth. The four persons making the trip included friends of Portsmouth leadership and founding members Portsmouth City Councilman Sean Dunne, local developer Tim Wolfe and attorney Jeremy Burnside. Their spokesman added it was far too early to go into any details, explaining later the Friends of Portsmouth as a group simply do not like to jump the gun with announcements. One announcement Rutman was happy to make was to note the opening of the Friends of Portsmouth headquarters on Second Street. Rutman said the HQ will be home to the Friends new Portsmouth Ambassador Edwin Martell. Martell will head up what Rutman said he hopes will be, and expects will be, a sizable group of volunteers who will serve as street-level ambassadors in Boneyfiddle and downtown Portsmouth. Those ambassadors will direct visitors around town, point out things for folks to do, places of interest and so on. They will also pick up trash and just generally be unofficial stewards of the city’s primary tourist and retail areas. Rutman noted the Friends already have a long list of persons volunteering to be ambassadors. In addition to being home base for the ambassador program, the Friends headquarters also will serve as a sort of retail location, ultimately renting bikes and quite possibly kayaks. To date, the Friends of Portsmouth signature event was, of course, the holiday themed Winterfest which ran through the Christmas season bringing lots of decorations to include a huge Christmas tree, a temporary skating rink and other festive trimmings to Market Square. Rutman said his group is declining at this time to release how much money Winterfest may have raised through skating fees and other activities such as the retail village and souvenir store set up on Market Square. Rutman did say a very rough estimate would put the number of skaters who used the temporary rink at around 8,000. Prior to Winterfest, Friends of Portsmouth leaders indicated dollars raised would go towards purchase of lighted arches the group hopes to put in place over Second Street. Talking about the arches previously, Wolfe said they will be modeled after arches used in the Short North neighborhood in Columbus. On Friday, Rutman said he needed to double check the potential cost of those arches, though that cost previously was reported as about $75,000 each. https://www.portsmouth-dailytimes.com/wp-content/uploads/sites/28/2019/02/web1_FOP-HQ.jpgEven though the headquarters wasn’t open, in early December, NSD, a local design firm, put some holiday decorations in the windows of the now newly opened headquarters of the Friends of Portsmouth on Second Street.